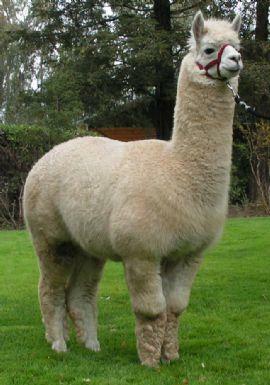 Congratulations to Steve & Casey Aitchison, of Epic Alpacas, for their purchase of Alta Luna's Eva! Eva's sire is Alta Luna's Man from Uncle, a full Peruvian, and dam is Alta Luna's Granita whose background is mostly Chilean with some true black and grey in her heritage. KC's Satchmo is a handsome medium fawn male sired by full Peruvian, full Accoyo, TCB's Sullivan. 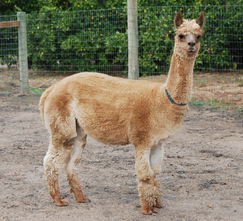 Satchmo's paternal grandsire is the legendary PPPeruvian Royal Fawn, the 1999 and 2000 "National Get-of-Sire" winner at the national AOBA show. Royal Fawn was the only back-to-back winner in alpaca history! Royal Fawn sold for $600,000 in October 2005! Satchmo's dam is our lovely Alta Luna Eva. Eva's sire is Alta Luna's Man from Uncle, a full Peruvian, and her dam is Alta Luna's Granita whose background is mostly Chilean with some true black and grey in her heritage.